Utrikes.Three weeks ago Mikael Skillt worked for a construction company in Stockholm, Sweden. Today, he is a volunteer in a nationalist organization in Kiev. In an interview with Fria Tider, Skillt tells the story of a Ukraine where the role of the police has been assumed by paramilitary Right-wing groups. At the end of February, mere days after Ukraine's president, Viktor Yanukovych, was overthrown, Mikael Skillt boarded a plane bound for Kiev. He left behind a relationship that had just ended, a terrace house in a Stockholm suburb and a well-paid job as a planner at a construction company. "It was not an easy decision to make," Skillt said when Fria Tider spoke to him over Skype. His former employer, also a personal friend, was not happy when Skillt suddenly quit his job to go to Ukraine. Skillt said he went anyway because of a sense of solidarity with the Ukrainian nationalists. 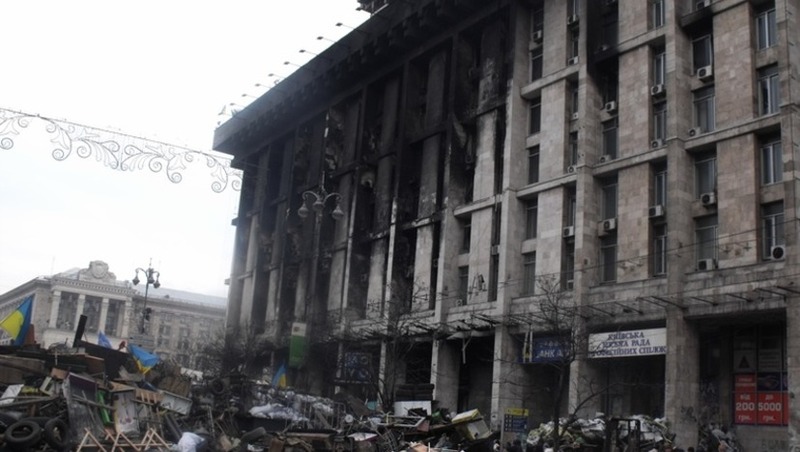 "Nationalists have died on the streets of Kiev," he recounted. "And I was able to help them. That is more important than my personal well-being."
After arriving in Ukraine, Skillt joined the organization C14, also known as Sich, which is closely affiliated with the nationalist party Svoboda. In an interview with the BBC, C14's leader, Yevhen Karas, says that his organization has approximately 200 members and that its main objective is to sever all ties between Ukraine and Russia. Some have called him a Nazi, but he firmly denies that accusation. "I don't think I'm a Nazi, I'm a Ukrainian nationalist," Karas told the BBC. "The main confrontation is about that some ethnic groups have control of many business structures, some economical and political forces."
When asked which ethnic groups he was referring to, Karas clarified, "Russians and Jews. Some non-Ukrainian groups control a huge percent of the economic and political power. And of course, in this situation you have some tension with the Ukrainian people."
Today, C14 is a force to be reckoned with. Together with the so-called Right Sector, C14 patrols the streets of Kiev, fights crime and guards public buildings. Skillt and several other Swedish volunteers participate in the patrols. "The police force still exists, but isnt seen much," he said. "Most of the police officers you see on the streets are only traffic police. Maintaining order is primarily being done by C14 and the Right Sector."
The reason why there is a power vacuum that is currently being filled by these groups is that the special police force, Berkut, was disbanded following the overthrow of Yanukovych, and many officers of the regular police force were also sacked. "Corruption among the police has been massive and many have been dismissed," Skillt explained. "Some have fled for their lives because they were guilty of corruption, or otherwise behaved like bastards. The officers that remain are pro-Ukrainian and not corrupt. But because of their low-life former comrades, people don't have much confidence in them either."
When the Ukrainian parliament convened on March 17 to discuss the situation in Crimea, C14 and the Right Sector provided security. Skillt was part of the group that C14 sent to guard the parliament. A photo showed him wearing a uniform, a bulletproof vest, a ski mask and sunglasses. He carried a gun case on his back, but did not want to tell us what it contained. "A fishing pole," he said. Other photographs from the parliament, however, show uniformed, masked men openly carrying automatic rifles. Skillt confirms that both C14 and the Right Sector possess firearms, even though guns are not part of their standard equipment. "The ability to handle guns safely varies widely from person to person. Some of the guys in the Right Sector are like monkeys with guns," he said. "You put your life at risk just by being near them, when theyre armed. It's pure slapstick, they have guns but handle them carelessly, as if they were wooden sticks. In C14, safety routines are much better. It's almost up to the standard of the Swedish military."
Skillt described C14 as a more professional and disciplined unit than the Right Sector. Before Skillt was approved for service in C14 his physical fitness and marksmanship were tested. Candidates are expected to be able to run five kilometers in under 25 minutes while wearing a full uniform, a bulletproof vest and carrying other personal equipment. "It's not as easy as it sounds," Skillt said. "Part of the course is a steep uphill slope. I made it in 24 minutes and a few seconds."
One incident from last week illustrates the influence of these paramilitary, Right-wing groups in post-revolutionary Ukraine. Skillt told us that he was one of approximately 20 activists from C14 who went to the office of the Ukrainian prison authorities in Kiev. The purpose of the visit was to secure the release of one of the organization's members, who had been jailed for participating in the street-fighting with the police while Yanukovych was still in power. Outside of Kiev, Skillt has visited a number of cities in the Russian-influenced eastern regions of Ukraine, mainly Kharkov, Odessa and Donetsk. "The mood there is not very good," Skillt said. "People have been killed in several places. In Kharkov, the Right Sector has opened fire. A close friend of many C14 members was recently stabbed to death in Donetsk."
In early March, pro-Russian protesters stormed a government building and detained thirty Right Sector activists who had occupied it. "Since then the control of that building, and several other such buildings in eastern Ukraine, has repeatedly changed hands between the Right Sector and pro-Russian activists," Skillt told us. "Right now I think pro-Ukrainian forces are in control of those buildings, but that could change quickly."
"That doesn't mean that there are no ordinary people and local activist groups there who are pro-Russian," he continued. "There are. But many of those who are very extreme and also skilled in militant activism are Russians."
Skillt has also spent time in western Ukraine, which is mainly populated by ethnic Ukrainians. The population there is generally more oriented towards Europe and the West than the people in the eastern regions. "In the west, the situation is very calm," Skillt explained. He said that the police are still in charge of maintaining order there, and have not been replaced by paramilitaries as in Kiev. When Fria Tider asked Skillt about rumors that the Ukrainian opposition itself may have been behind the shootings of protestors on the Maidan, he said that he is aware of them, but puts no stock in them. 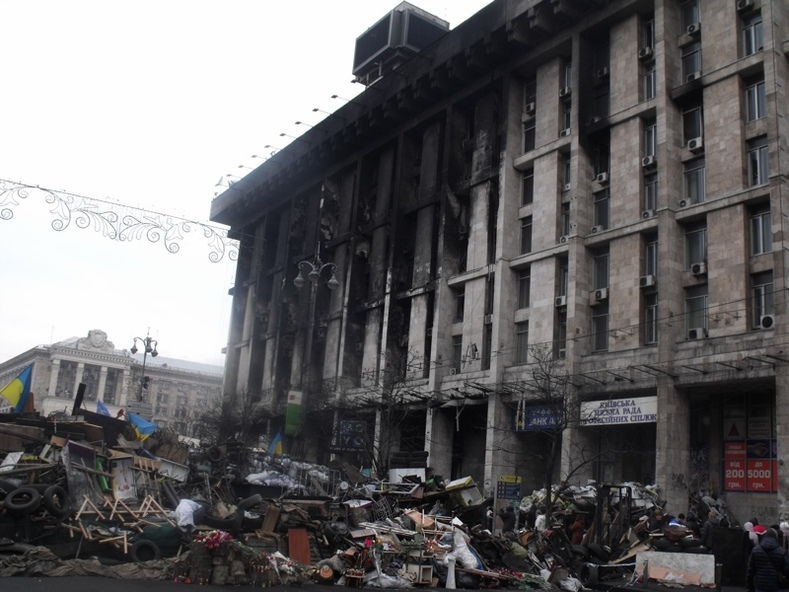 However, he said he has spoken to two people who sniped at the police on the Maidan Square during the riots. "They used Saiga semi-automatic rifles equipped with telescopic sights, and were positioned on the third floor of the Trade Unions Building on Maidan Square," Skillt said. "Their mission was to take out Berkut's snipers," he added. He also told us that he recently ran into a man in an American uniform, carrying an American-made rifle. "It was a bit odd, but it turned out he was Ukrainian," Skillt said. "He had a modified, short-barrel M-16 with a telescopic sight. We said a quick hello."
One of the projects Skillt is working on is to create an international center where nationalists from other countries can go and get to know like-minded Ukrainians. "It's mainly a question of networking and exchanging experiences concerning how to do practical politics. They could come and get an understanding of what has happened here and what is happening in other countries. The center will be located on C14's premises, but other groups are also involved. Svoboda will probably have a hand in it."
"In five years you will address me as colonel," he wrote over Twitter when asked what he will be doing five years from now, adding a smile emoticon. "No, really, I have no idea. I hope to commute between Sweden and Ukraine."